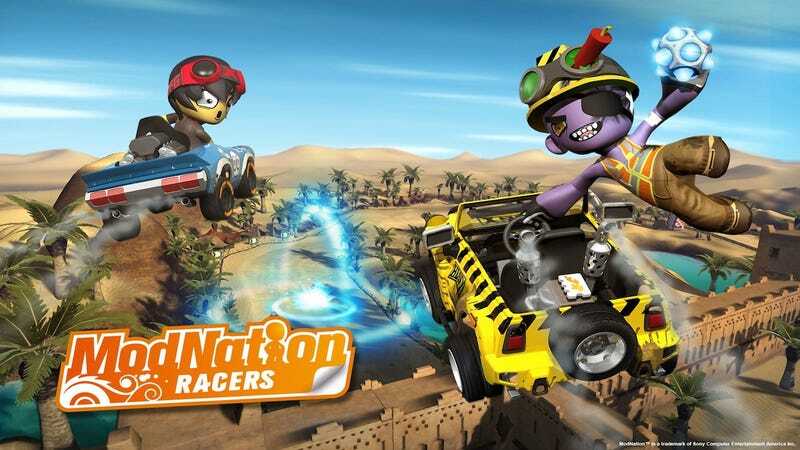 Sony's been making a big deal out of ModNation Racers on their upcoming handheld, the Vita. I still shudder to think about the ten minute stretch of their E3 press conference when (very nice, I should say) ModNation guys came onstage to demonstrate how to build a track and customize things in the game. I just wanted to fall asleep/watch Jane's Addiction already! Anyhow, according to the PlayStation Blog, the Vita game has been rechristened Modnation Racers: Road Trip. Which seems fitting. Rejected fan-suggested names include "In-A-Gotta-Mod-Vita," "Honey I Shrunk the ModNation Racers," and "Steve." I think I like "Steve" the best of all of those. Hmm, another of the top five suggestions is "ModNation racers: Purple Monkey Dishwasher." What makes me think that they only got five suggestions to begin with?